Plage Grand Baie est un paradis de bord de mer situé dans la ville de Rio Grande, près de Centres commerciaux, terrains de golf, hôtels et attractions touristiques (El Yunque Tropical Rain Forest et Bioluminiscent Bay Fajardo). Ce est un deux chambres à coucher, 3 salles de bains, condo plage duplex qui est équipé de la plupart des commodités modernes que vous attendez à votre domicile régulière - à savoir, deux portes en acier inoxydable réfrigérateur, four micro-ondes, cuisinière, couverts, argenterie, casseroles et des casseroles, un refroidisseur de vin, un capot qui sert un extracteur de fumée, trois téléviseurs, 2 lecteurs DVD, 3 unités A / C, chauffage de l'eau, laveuse / sécheuse, fer à repasser, sèche-cheveux, jacuzzi, serviettes, draps , etc. Salle de bains dans la chambre principale comprend un jacuzzi. Every time we walked into the condo during our 7 day stay, I was amazed by the view. The condo was spacious and convenient for our family of four with easy access to the quiet beach and clean pool. We had a great time and I've recommended this condo to multiple friends. It is precisely that magnificent view what led us to purchase this property. We are truly happy to see that you and your family enjoyed our unit. We appreciate your comments and look forward to receiving you back in the future. Truly enjoyed our time in Puerto Rico and our stay here at the property. Jorge was very helpful and a great host. The Condo was nicely decorated and had everything we needed to enjoy our weeks stay. Including an amazing view. We are very happy that you enjoyed your stay at our unit. It would be an honor for us to welcome you again on your next trip to the island. Recommended! Excellent property and owner! 10/10 would recommend this property to anyone looking to stay in the Rio Grande area! Jorge, the property owner, was friendly, accommodating, and helpful. The property description is 100% accurate. First of all, the condo is beautiful and secure - we especially loved the layout. 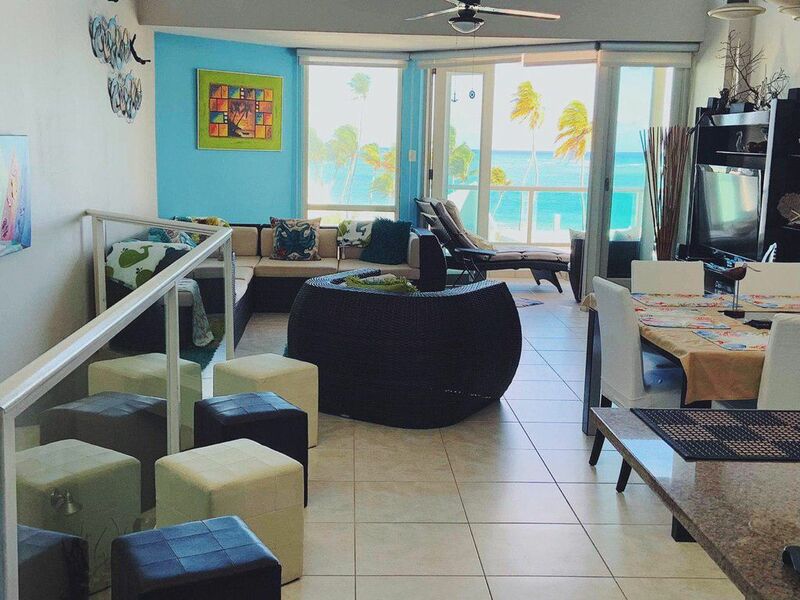 The main level contains a bathroom, kitchen, dining area, living room, and balcony with ocean view. The lower level has the master (king bed) bedroom with ocean view and bathroom. Also on the lower level is the guest bedroom with a jungle view (and coquí sounds), bathroom, and bunk beds. The lower level also has a washer and dryer. The upper level and both bedrooms on the lower level have their own air conditioners that worked perfectly. Many of the amenities in the condo seemed to be new. For example, some towels still had tags attached, and the kitchen pans appeared to have not been used. Everything we needed for days at the beach, cooking meals, and entertainment was provided. In fact, if you forgot to pack something there's probably no need to worry because it's already there! We brought a Roku and plugged into the TV for the kids. We cooked most of our meals in the rental, and appreciated the nearby, well-stocked supermarket (Ralph's). The location of the condo was very convenient for us to launch adventures to Luquillo, Fajardo, El Yunque, etc. On the days we needed to relax, the beach and pool mere steps from our door were perfect. The condo complex was very quiet. 5 days out of 7 the only other people we saw on the grounds were the security guards. There was also a distinct absence of other noises typically associated with Puerto Rico. If you've ever spent any time in PR you are probably well acquainted with the roosters, dogs, cats, and loud music. While there are a couple of roosters and a few cats that seem to take up residence on the condo grounds, the cats never made any noise and the few days the roosters were vocal it was easy enough to simply close the bedroom windows and forget about them. The condo complex itself is a bit off the beaten path so there's no traffic noise, and there we no neighbors on either side. To the south was a jungle, and to the north there was another condo complex that appeared to only be inhabited by a groundskeeper. One day we had a problem with the fridge that Jorge responded to immediately and there was a repairmen fixing it the next day. Check out Panedería El Yunque for bakery treats when you are here! It was a pleasure having you and your family as our guests at our unit. We hope you come back in the future. The apartment and the beach are excellent. We very much appreciate your comment and hope you and your family will come back to our island soon and decide to stay at our Beach Condo again. We really enjoyed our stay at this property. The pool and beach were great, and at least during our stay, not at all busy. The condo was generously furnished with everything we would ever need. The location is great. It's in a quiet area, but still just a short drive to everything. Jorge was a great host and did a great job of making sure we were settling in and provided some excellent recommendations for the area. Definitely looking forward to our next stay. We are so happy that you had a great time at our unit. We would love it if you could come back again in the future.